On Monday, Mozambique’s Land and Environment Minister Celso Correia said the number of people in makeshift camps after a powerful cyclone Idai in Mozambique has risen by 18,000 to 128,000 but the death toll remains roughly unchanged at 447. “The loss of lives remains the same as yesterday,” Correia said. “The number of people saved in INGC (National Institute of Disaster Management) camps has increased to 128,000,” Correia told journalists during a briefing. Fears continue to grow in Mozambique and neighboring African countries after been sacked by a deadly Cyclone Idai, March 14. The country witnessed more casualties on Friday, following a heavy flood arising from worsening atmospheric conditions. Reports say this is the deadliest natural disasters to hit the Southern Africa nation in decades. The situation in the port city of Beira in Mozambique was “boiling” as residents suffered shortages of food, water and other essentials one week after a devastating cyclone, the head of a South African rescue operation said on Friday. The deadly incident has generated global attention, with international agencies and other bodies weighing in the ongoing rescue operation. According to the World Meteorological Organisation (WMO), Idai, a Category IV storm, could be one of the biggest cyclone disasters south of the equator. “The cyclone created a storm tide of 3.5 to 4 metres that swept Mozambique’s coastal city of Beira,” WMO spokeswoman Clare Naden said in Geneva. Mozambique’s government had last week Wednesday declared three-days mourning period in the country to commiserate those affected by the incident. “Over 200 bodies had been recovered and an estimated 350,000 people had been affected by the storm,” Mozambique’s President, Filipe Nyusi had said while making the declaration. In Zimbabwe, at least 82 people have died and 200 have been injuried, mainly in Chimanimani. 217 people are reportedly missing. At least 923 homes have been destroyed in Chimanimani, Mutasa, Mutare, Chipinge, Buhera, Chikomba, Gutu and Bikita districts. In Chimanimani alone, eight bridges have been destroyed. Statistics of actual casualties since the event occurred have been conflicting. While Mozambique’s Land and Environment Minister claim the number of death toll stands unchanged at 447 on Monday, other sources suggests something different. UNICEF earlier estimated about 260,000 children have been affected and are in desperate conditions. The confirmed number of people killed in Mozambique and neighboring Zimbabwe and Malawi climbed past 600, according to News24. Amidst dipping humanitarian crisis in Mozambique and other affected countries, there are demands for more aids for those affected. Most of those displaced by the disaster have nothing to survive on. On Friday, Elhadj As Sy, secretary-general of the International Federation of Red Cross and Red Crescent Societies, said the relief efforts so far “are nowhere near the scale and magnitude of the problem”, and the humanitarian needs are likely to grow in the coming weeks and months. “We should brace ourselves,” the Secretary-General said. Nearly 90,000 Mozambicans are thought to be sheltering in temporary sites, while thousands of others are still stranded in floodwaters, AFP news agency reported. According to a BBC report, some 1.7 million people are said to be affected across southern Africa, with no electricity or running water in areas where homes have been swept away and roads destroyed by the floods. There are growing fears among citizens over worsening cases of the attack in the coming days, especially with experts predicting heavy rainfalls which could further increase the chances of heavy floods. 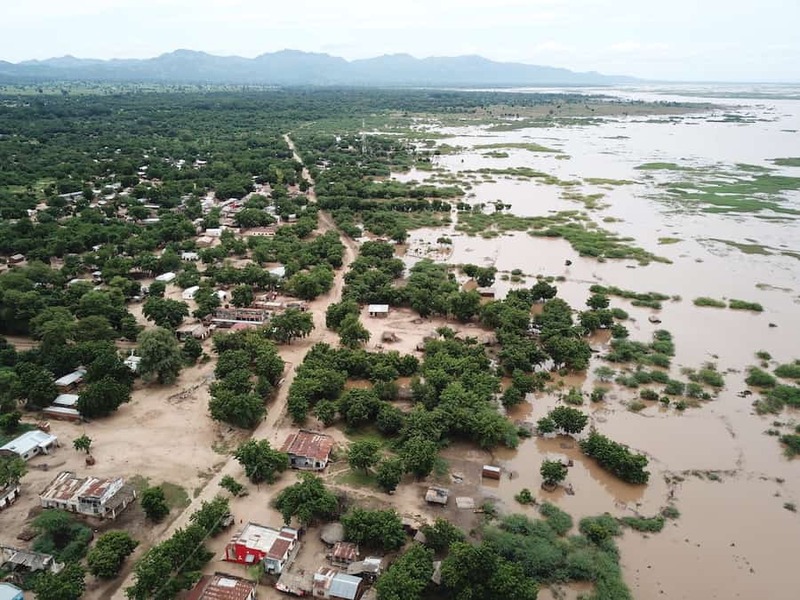 According to the United Nations’ humanitarian office, more flooding may come as heavy rains inland poured into the low-lying Beira area and nearby dams filled up threatening to burst the Buzi and Pungwe rivers again. “We’re going to have to wait until the flood waters recede until we know the full expanse of the toll on the people of Mozambique,” said U.N. Office for the Coordination of Humanitarian Affairs (OCHA) coordinator Sebastian Rhodes Stampa on Saturday. The recent development is likely to strengthen measures to tackle global warming and climate change in the continent by African leaders, many observes. The continent has consistently thrown it behind international efforts to mitigate the effects of global warming and climate change on the world. leaders from Africa, for instance, were a key part of the 1994 UN convention to combat desertification — a particular concern on a continent where two-thirds of the land is arid or semi-arid. Many African countries also were early signatories to the 1992 UN Framework Convention on Climate Change (UNFCCC) and the 1997 Kyoto Protocol, the first and to date only international treaty setting binding limits on pollution emissions. However, many have argued that the success of such measures will be determinative of other factors, such as a calculated attempt to reduce growing poverty level in the country. The economic, political and social consequences of climate change could threaten world peace unless the world acts to prevent it, former UN Secretary-General Ban Ki-moon had said while addressing the Security Council. “Throughout human history people have fought over natural resources,” he noted. He had added: “Changing weather patterns, such as floods and droughts and related economic costs … could risk polarizing society and marginalizing communities,” thereby increasing the risk of conflict and violence.